If you were a kid in the 80’s, chances are you had a Cabbage Patch Kid. I know they’re still around today, but they were huge back then, and as such, they were ripe for lampooning. Art Spiegelman, a Pulitzer Prize-winning cartoonist and consultant for the trading card company Topps, was the guy who came up with the idea for Garbage Pail Kids. Spiegelman put together a team for the project, recruiting artist John Pound to draw the first run of cards. As the popularity of the cards grew, more artists were brought in. 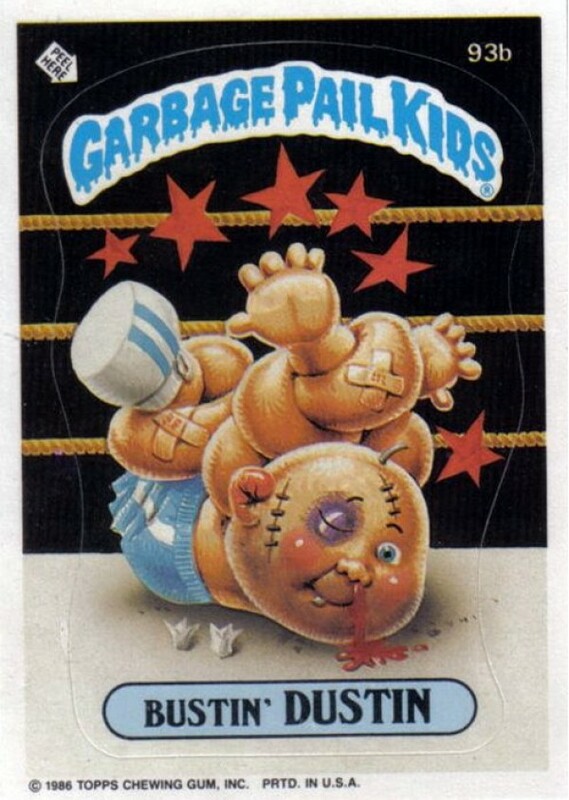 The first series was released in 1985, and soon enough, Garbage Pail Kids were the talk of the town. Well, for us kids, anyway. Grown ups didn’t want a thing to do with them. They were even banned from a lot of schools. I couldn’t get anyone to buy me any. So, to circumvent this, I traveled my grandmother’s neighborhood in search of old bottles and cans. When I had found as many as I could, I’d walk to the little store on the corner, turn them in for the refund money, and then promptly buy up as many GPK packs as I could. At the height of their popularity, a couple interesting things happened. Hollywood cashed in on the craze by creating a movie that, well, the less said about it the better. I’m not ashamed to say that I do own it on DVD, but I can not in good conscience recommend it to anyone. It’s one of those “you had to be there” things. There was also a cartoon series created, but it never made it to air. However, it has since been released as a DVD box set. Also, when it got too big to ignore, Coleco, the makers of Cabbage Patch Kids, sued Topps for trademark infringement. The two companies were able to settle out of court, with Topps agreeing to modify the looks of their characters and change the logo design. 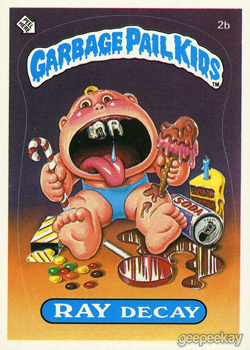 In recent years, Topps have brought back GPK a few times. I’m actually unsure of how they’re doing these days, but I’m pretty sure they’re not as popular as they were upon their original release. We’re all just too desensitized to this sort of thing now. Another attempt at a movie is in the works as well, probably as CGI rather than little people in costumes. When he’s not sorting his Trapper Keepers or acid washing his jeans, you can find Cornmeal on Superficial Gallery. For more Garbage Pail Kids art and history, visit GEEPEEKAY, Pound Art, or Barren Aaron’s GARBAGE PAIL KIDS Reference Guide. 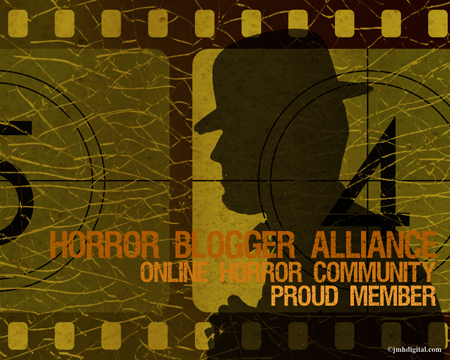 ‹ Horror GIF of the Week: We Got the Spirit! These cards are so quintessentially 80’s. 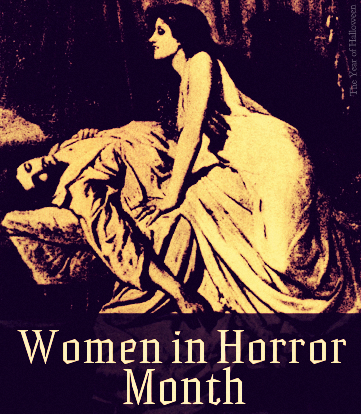 Never did see the movie, but that trailer is actually terrifying, darling. Really, you never saw it? Well, don’t watch it now. The magic will not be there and all you will see is a very, very dumb movie. The 80s seemed to be largely about pushing boundaries, and holy crap did they ever do it. Remember the Canadian kids’ show “You Can’t Do That on Television”? The name says it all. Good times. Dinosaurs Attack are friggin’ awesome cards, this is true. And I watched “You Can’t Do That On Television” every chance I got. This post is nothing less than magnificent™! 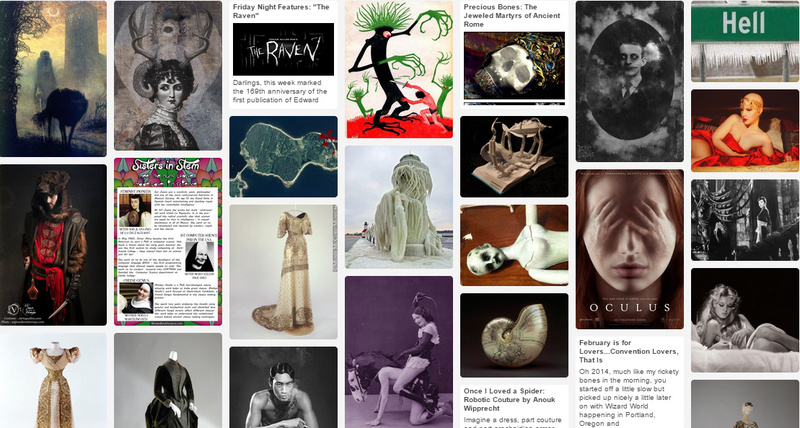 You just brought back so many locked memories, and night terrors. I do remember these from my days as a kid, as I am 107 years old… I didn’t care much for Cabbage Patch Kids, and these just made everything better. I do have a few unopened packs of vintage Star Wars cards, and we can still smell the bubble gum sticks that used to be inserted in these cards. Wonderful, just wonderful. Thank you very much Le Clown. Those bubble gum sticks were always hard as rocks when they were fresh. I can only imagine what they’d be like now. You could probably cut diamond with them. Noting wrong with Elmo (the puppeteer on the other hand…) Jokes aside, I was just drawing a parallel between the Cabbage Patch Kid craze and the Tickle Me Elmo riots. Thanks! You aren’t so bad yourself. Or were you talking to Eva? “Toy collector” seems like the kind of thing that would come after a primary identifier: Cornmeal: Murderer / Toy Collector.